Using the mouse and keyboard to make tables in Word is easy, so is there another way to do it if you feel more comfortable with the keyboard. While adding tables to a document one has to toggle between the mouse and keyboard to punch in data into the fields and to adjust the column width or height. 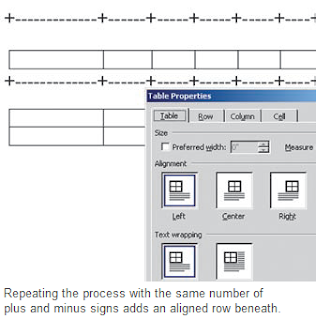 For making a table without using the mouse, you can use the ‘+’ and ‘-‘ signs on the keyboard. The former determines the start of a column and the latter sets its width. So start with a ‘+’ sign and make a series of ‘-‘ signs thereafter, punching ‘+’ wherever you need a new column. You can make multiple rows by repeating the procedure. 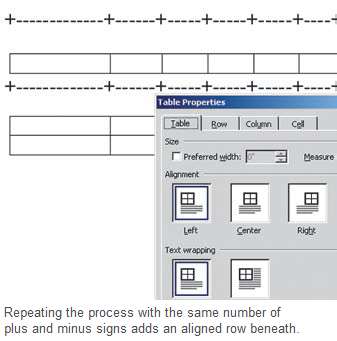 To adjust the measurements, push the context menu button on the keyboard and access the ‘table properties’.